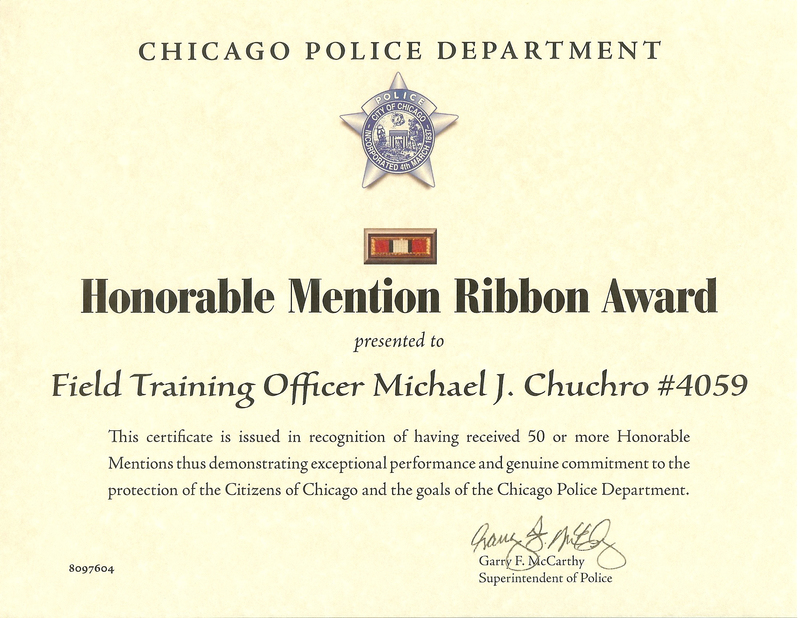 Active and Inactive representations of of all approved Chicago Police Department awards presented in the form of a ribbon bar. Description: Granted annually to any sworn or civilian group or team that has displayed determination in accomplishing its mission and performed uniformly in a manner justifying collective recognition. Additionally, this superior and exemplary group or team must have demonstrated motivation, excellence, successful collaboration, and dedication to duty that positively influenced the Department and set this group / team apart from all other groups / teams within a Bureau (i.e. a combination of factors that may include quality arrests and prosecution, crime reduction, minimal complaints, solving a pattern of crimes, or accomplishing goals under adverse conditions.) The Annual Bureau Award of Recognition will be granted to each of the following: Office of the Superintendent, Bureau of Patrol, Bureau of Patrol – Area North, Bureau of Patrol – Area South, Bureau of Patrol – Area Central, Bureau of Detectives, Bureau of Organized Crime and Bureau of Support Services. Presentation: This award is presented to Sworn Department members in the form of a ribbon bar and certificate. 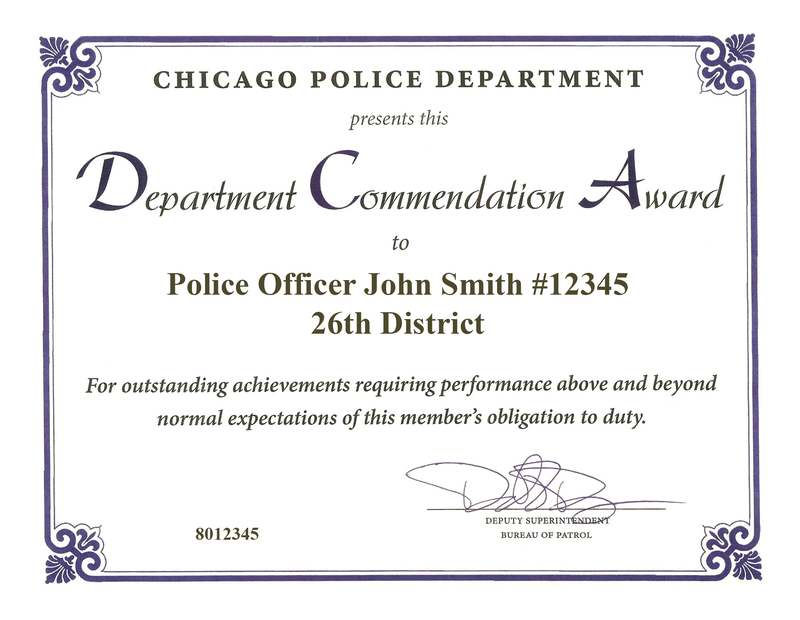 Civilian Department Members are presented this award in the form of a Chicago Alternative Policing Strategy (CAPS) lapel pin and certificate. Material: Nylon and Dacron composition “campaign” ribbon material. Color: Composed of dark blue, red and white colors. Centered shall be a 1/8 inch wide vertical red stripe. On each side of the red stripe shall be a 1/8 inch wide vertical white stripe. On each end shall be 1/2 inch wide vertical dark blue stripe. This ribbon is similar in size and design to the Idaho National Guard Distinguished Service Medal Ribbon. Assembly: Typical u-channel component with ribbon fastened to and wrapped around the channel. Top view assembly dimensions are to be approximately 1 3/8 inches in length and 3/8 inch wide. Frame: As seen from top view, the frame shall be rectangular, one piece, manufactured from metal with an etched yellow finish and measure approximately 1 7/16 inches in length by 7/16 inch high. The frame will have a rectangular “window” which measures 1 1/4 inches by 1/4 inch. The frame shall have four sides at 90 degrees to the frame face and measure approximately 1/16 inch in width. Integrated as part of the one-piece frame with formed sides are four fold tabs equally spaced on the long side of the frame (two per side). These tabs when folded shall fasten the frame to the u-channel ribbon assembly. Mount: Typical pin and clutch back fastener on a bar which slips into a u-channel component. Description: Presented to any Sworn or Civilian Department Member or Citizen who has made a significant impact upon the quality of life within their community by identifying and resolving problems. This award was originally named the “Partnership Award” and was renamed effective May 5, 1998. Presentation: This award is presented to Sworn Department Members in the form of a ribbon bar and certificate. 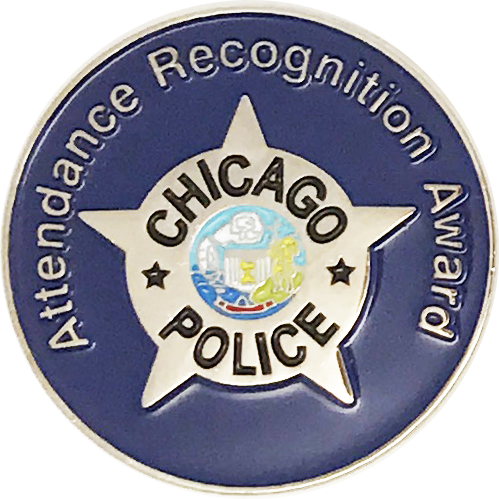 Civilian Department Members and Citizens are presented this award in the form of a Chicago Alternative Policing Strategy (CAPS) lapel pin and certificate. Color: Composed of dark blue, light blue, red and white colors. Centered shall be a 3/16 inch wide vertical white stripe. On each side of the white stripe shall be a 1/16 inch wide vertical dark blue stripe followed by a 1/16 inch wide vertical red stripe. On each end shall be a 5/16 inch wide vertical light blue stripe. This ribbon is similar in size and design to the U.S. Air Force Outstanding Airman of the Year Ribbon. Description: Granted to any Sworn or Civilian Department Member who, beginning January 1, 2004, for any thirty-six consecutive calendar month period, has not been on the medical roll, with the exception of IOD. Presentation: This award is presented to Sworn Department Members in the form of a ribbon bar and certificate. Civilian Department Members are presented this award in the form of a lapel pin and certificate. Color: Composed of blue and light blue colors. Centered will be a blue stripe measuring 3/8 inch wide. There will be four alternating 1/8 inch wide stripes of light blue and blue on both sides of the center stripe. This ribbon is similar in size and design to the U.S. Air Force Longevity Service Ribbon. 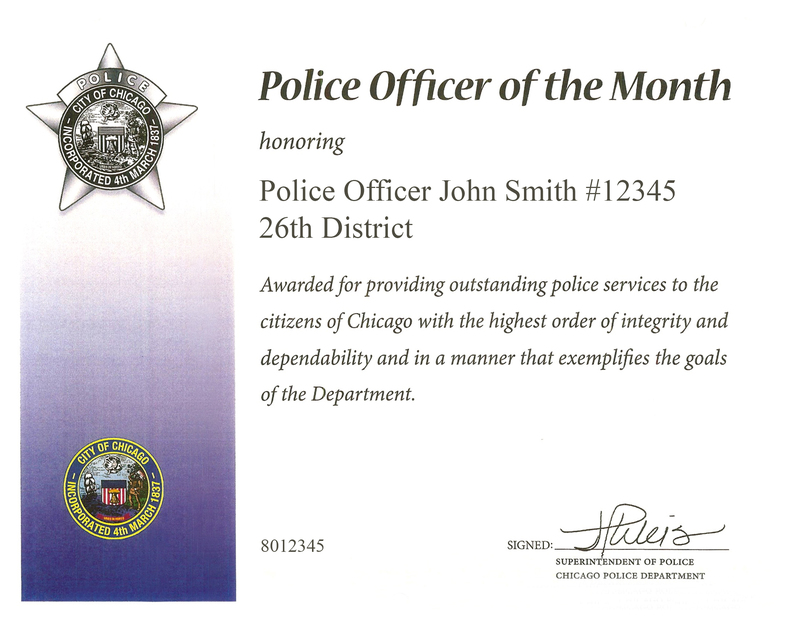 Description: Granted to to any Sworn Department or Civilian Member for exemplary service, dedication, and leadership. Eligibility for the award is open to any Department member who performs their duties with dedicated professionalism; strives for continuous personal and professional development; demonstrates operational excellence; exhibits professional zeal in the performance of their duties; inspires enthusiasm in their fellow Department members; encourages and instills high expectations in their fellow Department members; maintains accurate knowledge of Department directives; and demonstrates a sense of community awareness. Presentation: This award is presented to Sworn and Civilian Department Members in the form of a ribbon bar and certificate. Color: Composed of blue, white and yellow colors. Centered will be a 1/2 inch vertical white stripe. On each side of the white stripe shall be a 1/16 inch wide vertical yellow stripe. On each side of the yellow stripe shall be a 1/4 inch wide vertical dark blue stripe. On each side of the dark blue stripe shall be a 1/8 inch wide vertical yellow stripe. This ribbon is similar in size and design to the U.S. Air Force Distinguished Service Medal Ribbon. Description: Granted to all Sworn and Civilian Department Members on active duty status during the year 2004, a year in which violent crime took a dramatic drop primarily due to the efforts implemented by the Chicago Police Department. This award was granted in recognition of their service. 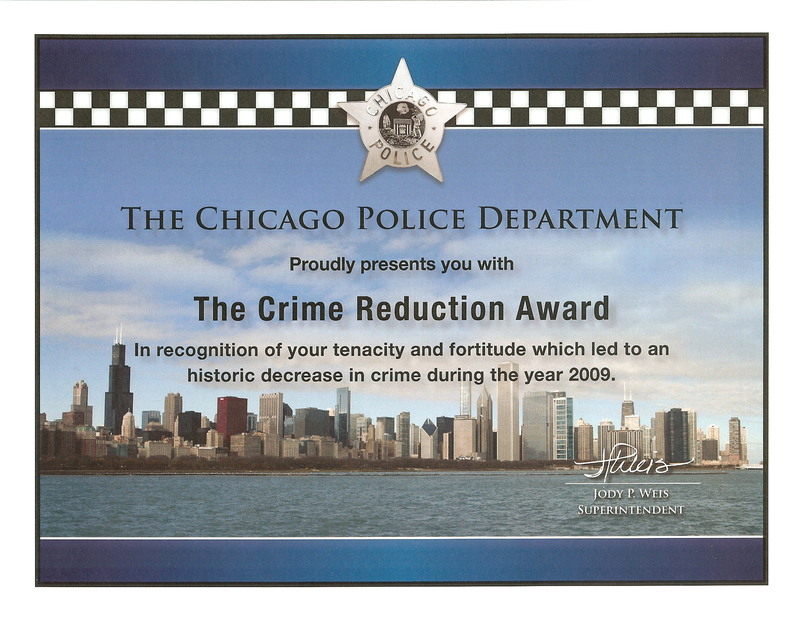 This award was originally named the “Crime Reduction Award” and was renamed in March 2011 when the Crime Reduction Award 2009 was introduced. Color: Composed of green and white colors. Centered will be a vertical white stripe measuring approximately 1/8 inch wide. There will be two 5/8 inch wide vertical green stripes on both sides of the center stripe. There will be a 3/16 inch wide vertical white stripe on the outside of each green stripe. A 1/8 inch green stripe will border each edge. This ribbon is similar in size and design to the U.S. Coast Guard Commendation Medal Ribbon. 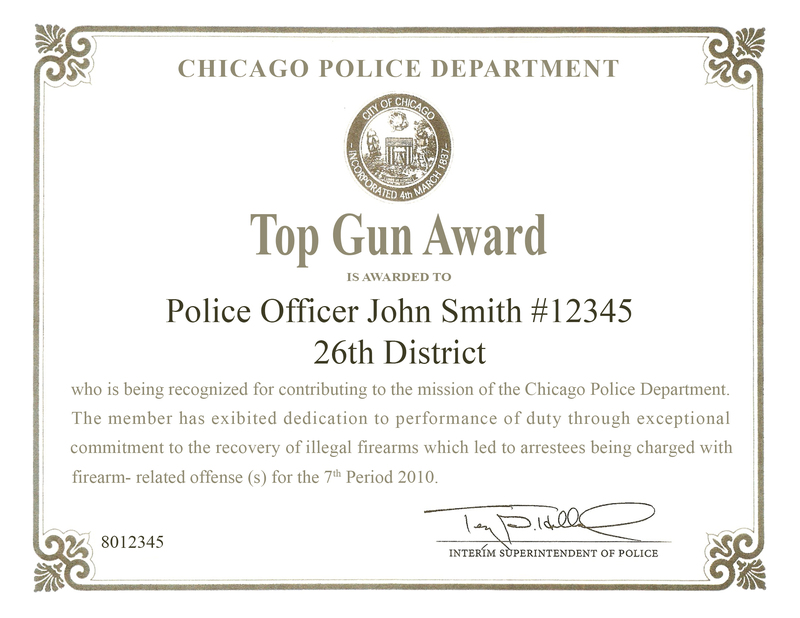 Description: Granted to all Sworn and Civilian Department Members on active duty status during the year 2009, a year in which violent crime took a dramatic drop primarily due to the unified efforts implemented by the Chicago Police Department. This award was granted in recognition of their service. Presentation: This award was presented to Sworn Department Members in the form of a ribbon bar and certificate. 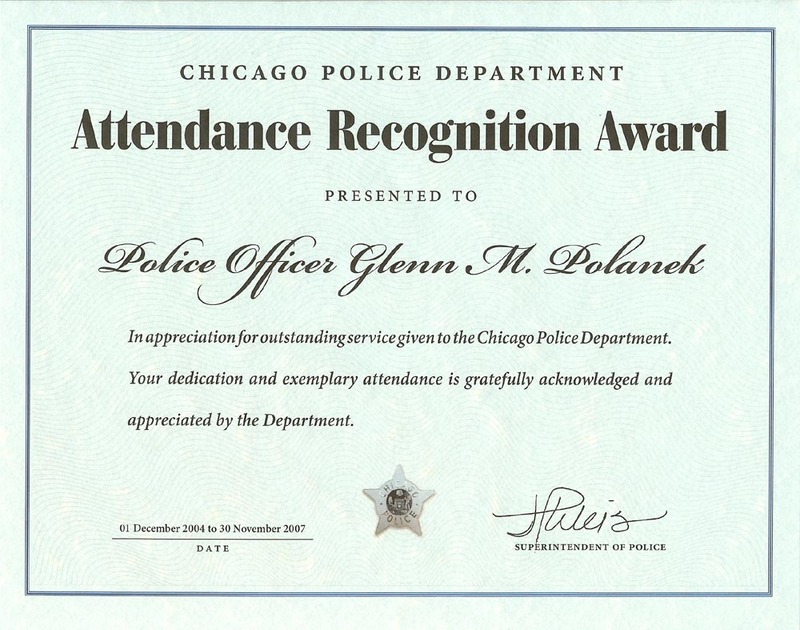 Civilian Department Members were presented this award in the form of a Chicago Alternative Policing Strategy (CAPS) lapel pin and certificate. Color: Composed of black, dark blue, light blue and white colors. Centered will be a narrow black vertical stripe. Moving outward this stripe will fade into dark blue and then into white before fading back into light blue and again fading to light blue. This ribbon is similar in size and design to the U.S. Navy Arctic Service Ribbon. Presentation: Granted to Sworn or Civilian Department Members for an outstanding act or achievement that brings great credit to the Department and involves performance above and beyond that required by the member’s basic assignment. Presentation: This award is presented to Sworn Department Members in the form of a ribbon bar and certificate. 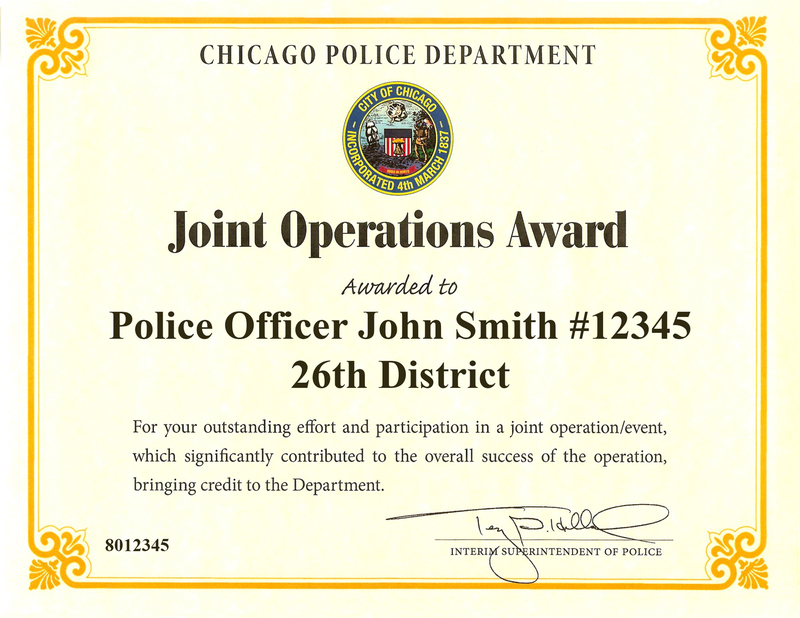 Civilian Department Members are presented this award in the form of a Chicago Alternative Policing Strategy (CAPS) lapel pin and certificate. Although this award was established on April 28, 1962 it was only presented in the form of a certificate. The corresponding ribbon bar wasn’t established until May 18, 1979. Color: Composed of a dark blue color. This ribbon shall be a 1 1/4 inch vertical dark blue stripe. This ribbon is similar in size and design to the U.S. Army Presidential Unit Citation Ribbon. Description: Granted to any Sworn Department Member displaying exemplary service in identifying, analyzing or responding to causes, conditions and problems in an area designated as a Level I or Level II Deployment Operations Center zone. Presentation: This award is presented to Sworn Department Members in the form of a ribbon bar once a member has been awarded five Deployment Operations Center Award Certificates. Upon receipt of ten Deployment Operations Center Award Certificates the award is presented tin the form of a ribbon bar with a silver star. Upon receipt of twenty Deployment Operations Center Award Certificates the award is presented tin the form of a ribbon bar with a gold star. Color: Composed of dark navy, gold and green colors. Centered will be a dark navy stripe measuring approximately 1/4 inch wide. There will be gold stripes 1/16 inch wide on both sides of the center stripe. There will be green stripes 3/16 inch wide on both sides of the gold stripes. There will be a 1/8 inch gold stripe on both ends of the green stripe. A 1/8 inch green stripe will border each edge. This ribbon is similar in size and design to the NCO Professional Development Ribbon. Description: Granted to any Sworn Department Member who has been nominated to the FOP Lodge 7 Awards committee in consideration for an act of bravery and/or performing above and beyond the call of duty. Presentation: This award is presented in the form of a ribbon bar and plaque. Color: Composed of baby blue, blue, grey and yellow colors. Centered will be a 3/8 inch wide vertical baby blue stripe. On each side of the baby blue stripe will be a 1/8 inch wide vertical blue stripe. On each side of the baby blue stripe will be a 1/16 inch wide vertical yellow stripe. On each side of the yellow stripe will be a 1/8 inch wide vertical blue stripe. On each end will be a 1/8 inch wide vertical grey stripe. This ribbon is similar in size and design to the Air Reserve Meritorious Service Medal Ribbon. Description: Granted to any Department sworn member who has demonstrated outstanding performance and has received a minimum of 50 Honorable Mention Certificate Awards. Presentation: This award is presented to Sworn Department Members in the form of a ribbon bar and certificate. Color: Composed of black, orange and white colors. Centered will be a 3/8 inch wide vertical white stripe. On each side of the white stripe will be a 1/8 inch wide vertical olive green stripe. On each end will be a 3/8 inch wide vertical orange stripe. This ribbon is similar in size and design to the Multinational Forces and Observers Medal Ribbon. Description: Granted to any Department sworn member who serves in good standing in the Honor Guard for a minimum of five consecutive years. Color: Composed of dark blue, red and white colors. Centered will be a 7/8 inch wide vertical dark blue stripe. On each side of the dark blue stripe will be a 3/32 inch wide vertical red stripe. On both ends will be a 1/32 inch wide vertical red stripe. Affixed to the center of the ribbon is a folded flag pin. This pin measures 49/200 inch tall, 17/50 inch wide, and 11/200 inch thick. This pin is dark blue in color, surrounded with a gold color border, and features four white stars. The pin has one star positioned at the top and three additional stars positioned across the lower border. This ribbon is similar in size and design to the New Jersey National Guard Honor Guard ribbon. Description: Granted to a Sworn or Civilian Department Member or Civilian Members of another governmental city agency whose efforts and participation in a broad multi-agency joint operation / event, spanning several days or more, significantly contributed to the overall success of the operation. Presentation: This award will be presented to Sworn Department Members in the form of a ribbon bar and certificate. Civilian Department Members and Civilian Members of outside agencies are presented this award in the form of a certificate. Color: Composed of dark navy, light blue, red and yellow colors. Centered will be a dark navy stripe measuring approximately 1/4 inch wide. There will be gold stripes 1/16 inch wide on both sides of the center stripe. There will be light blue stripes 1/8 inch wide on both sides of the gold stripes. There will be a 1/8 inch red stripe on both ends of the gold stripes. A 1/8 inch light blue stripe will border each edge. This ribbon is similar in size and design to the U.S. Navy Reserve Sea Service Ribbon. Description: Granted to any Sworn or Civilian Department Member for a successful effort in saving a human life that involved exceptional courage or performance. Presentation: This award is be presented to Sworn Department Members in the form of a ribbon bar and certificate. 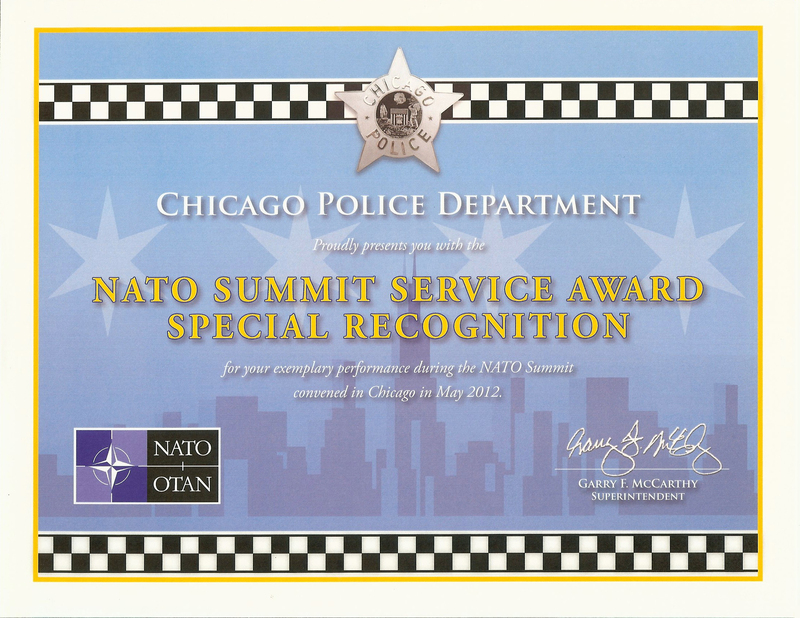 Civilian Department Members are presented this award in the form of a Chicago Alternative Policing Strategy (CAPS) lapel pin and certificate. Color: Composed of a dark green color. This ribbon shall be a 1 1/4 inch vertical dark green stripe. This ribbon is similar in size and design to the Oklahoma National Guard Exceptional Service Medal Ribbon. Description: An award granted to any Sworn or Civilian Department Member who is currently or was formerly a member of any branch of the United States Armed Services during his or her career as a Department Member and during a time of conflict or war was deployed or activated to full military service, with the exception of annual summer camp or training, whether involuntary or voluntary. Presentation: This award was presented to Sworn Department Members in the form of a ribbon bar and certificate. Civilian Department Members are presented this award in the form of an enamel ribbon bar pin and certificate. Color: Composed of red, white and blue colors. Centered will be a 1/16 inch horizontal red stripe. On each side of the red stripe shall be a 1/32 inch wide horizontal white stripe. On each end shall be a 1/16 inch wide horizontal blue stripe. This ribbon is similar in size and design to the U.S. Army Reserve Components Overseas Training Ribbon. Description: An award granted to any Sworn or Civilian Department Member who is currently a member of any branch of the United States Armed Services or was honorably discharged from any branch of the United States Armed Services. This award is also granted in recognition for military service and deployment. Presentation: This award is presented to Sworn Department Members in the form of a ribbon bar with a blue star attachment for military service or ribbon bar with an oak leaf cluster attachment for military service and deployment and certificate. Civilian Department Members are presented this award in the form of an enamel ribbon bar pin and certificate; military deployment for civilian members will be recognized in the text of the certificate. 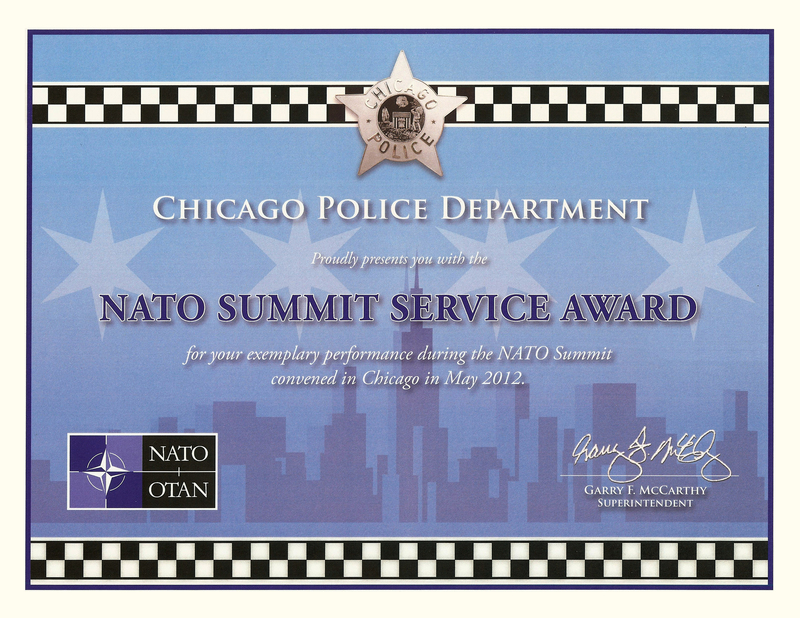 Description: Granted to Sworn or Civilian Department members on active-duty status between May 18, 2012 and May 21, 2012 that provided service to the City of Chicago during the NATO Summit. Presentation: This award is presented to Sworn Department Members in the form of a ribbon bar and certificate. Civilian Department Members are presented this award in the form of a certificate. Color: Composed of dark blue, gold, silver and white colors. Centered will be a 3/4 inch vertical dark blue stripe. On each side of the dark blue stripe will be a 1/16 inch wide vertical white. On the outside of each white stripe will be a 1/16 inch wide vertical silver stripe. On the outside of each silver stripe will be a 1/16 inch wide vertical white stripe. On the outside of each white stripe will be a 1/16 inch wide vertical gold stripe. On the outside of each gold stripe will be a 1/16 inch wide vertical white stripe. This ribbon is similar in design to the NATO Meritorious Service Medal. Description: Granted to Sworn or Civilian Department members on active-duty status between May 18, 2012 and May 21, 2012 assigned or detailed to the Mobile Field Force, Intelligence Section and the Area Central Bicycle Patrol Unit during the NATO Summit. Their performance is recognized with a silver star attachment on the ribbon bar. NOTE: The ribbon image is a placeholder representation. It is not of an actual ribbon. Description: Granted to any Department sworn member who has been honored by a municipal, county, state or federal governmental agency as a result of exceptional performance of duty, excluding awards issued while in the military, and has brought credit to the Department. 1. be in the form of a ribbon bar that is consistent with the size and shape of current Department award ribbon bars. 2. not conflict in design or color with existing Department award ribbon bars or be so similar in design or color that it would be confused with existing award ribbons. 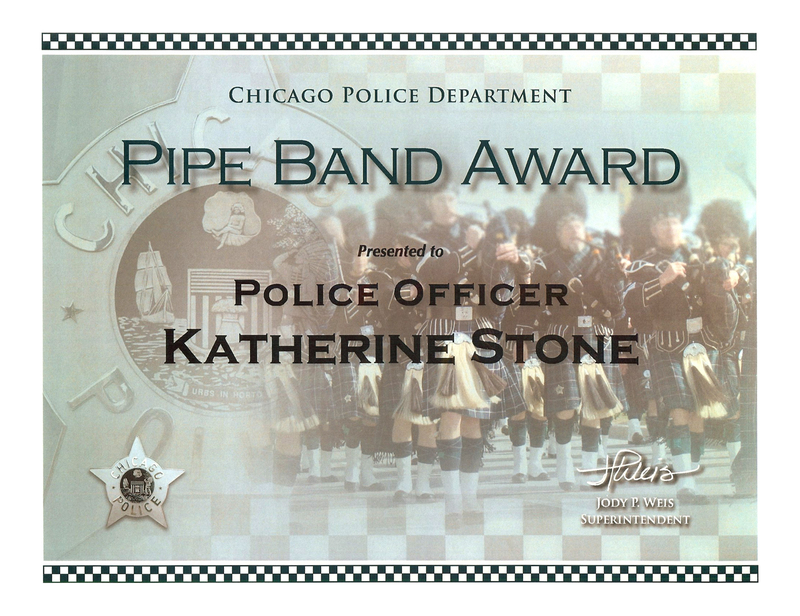 Description: Granted to any Sworn Department Member who served in good standing in a Department-recognized pipe band for a minimum of three consecutive years. Presentation: This award is presented to Sworn Department Members in the form of a ribbon bar and certificate. Civilian Department Members and members of outside agencies are presented this award in the form of an enamel ribbon bar pin and certificate. Color: Composed of green and white colors. Centered will be five 1/16 inch vertical white stripes. Each white stripe shall have a 5/16 inch separation. On each end shall be a 5/16 inch wide vertical white stripe. This ribbon is similar in size and design to the U.S. Army Commendation Award Ribbon. 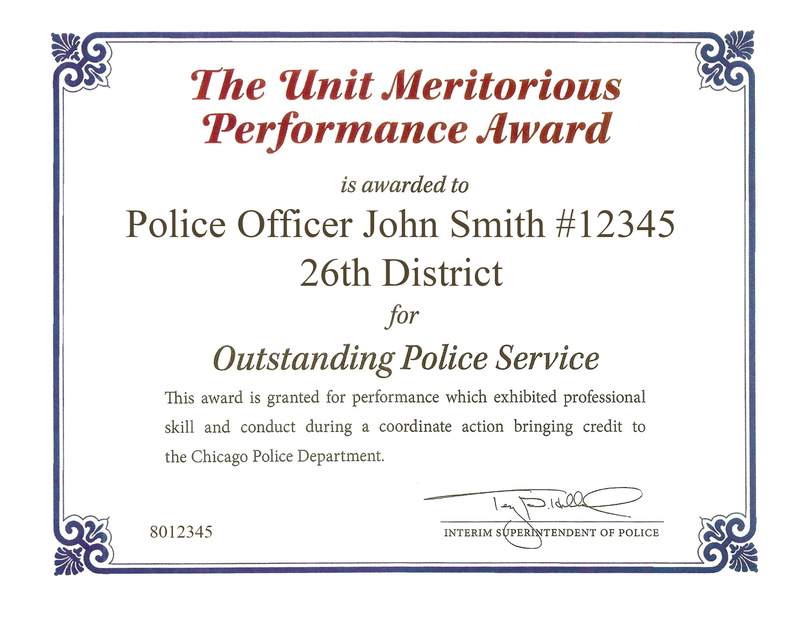 Description: An award granted to a Sworn Department Member or each Sworn Department Member of a team whose performance of duty during a specific month was characterized by such exceptional professional skill that it is merited recognition by the entire Department. Presentation: This award is presented to Sworn Department Members in the form of a ribbon bar and certificate. Although this award was established on September 4, 1975 it was only presented in the form of a certificate. The corresponding ribbon bar wasn’t established until January 8, 1988. Color: Composed of a yellow color. This ribbon shall be a 1 1/4 inch vertical yellow stripe. This ribbon is similar in size and design to the Arizona National Guard Exceptionally Long Service Medal Ribbon. 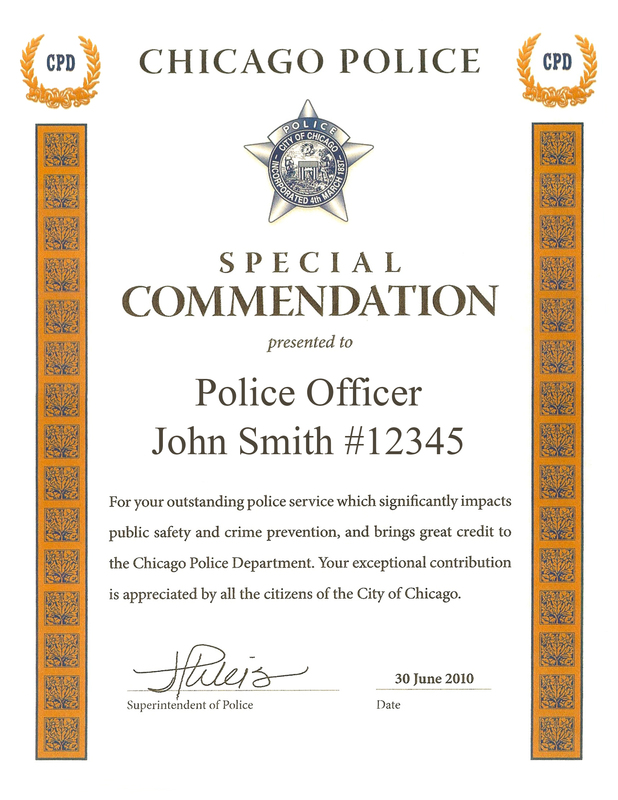 Description: Granted to all Sworn and Civilian Department Members on active-duty status on November 4, 2008, regardless of their duty assignment, for the outstanding police service provided throughout the city during the historic Presidential Rally held in Grant Park on November 4, 2008, an event attended by 240,000 people and resulted in unprecedented national and international attention to the City of Chicago. Presentation: This award is presented to Sworn Department Members in the form of a ribbon bar and certificate. Civilian Department Members in the form of a Chicago Alternative Policing Strategy (CAPS) lapel pin and certificate. Color: Composed of red, white, and blue colors. Centered shall be a 1/8 inch vertical red stripe. On each side of the blue stripe shall be a 1/16 inch wide vertical white stripe. On each side of the white stripe shall be a 3/8 inch wide vertical dark blue stripe. On each side of the dark blue stripe shall be a 1/16 inch wide vertical white stripe. On each end shall be a 1/8 inch wide vertical red stripe. This ribbon is similar in size and design to the U.S. Air Force Outstanding Unit Award Ribbon. 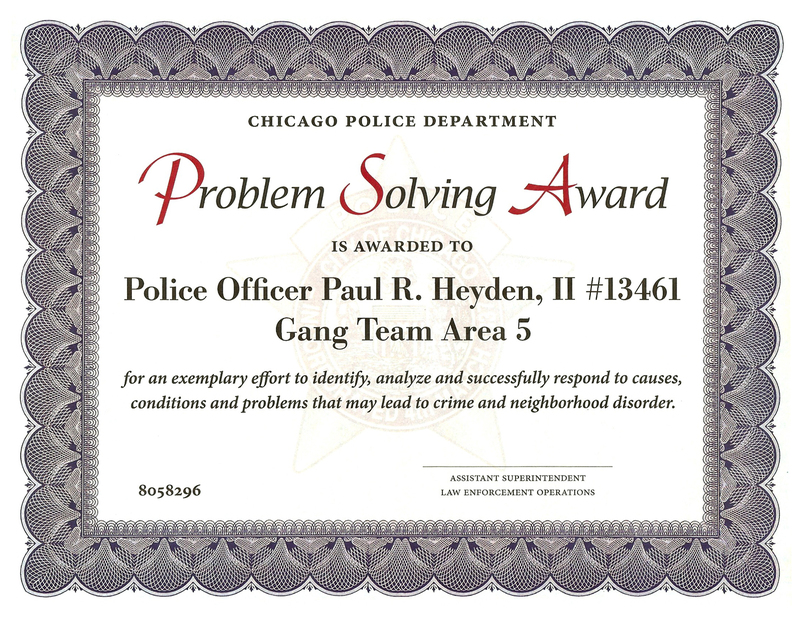 Description: An award granted to any Sworn or Civilian Department Member or member of the community who shows an exemplary effort to identify, analyze and successfully respond to causes, conditions, and problems that may lead to crime and neighborhood disorder. Presentation: This award is presented to Sworn Department Members in the form of a ribbon bar and certificate. 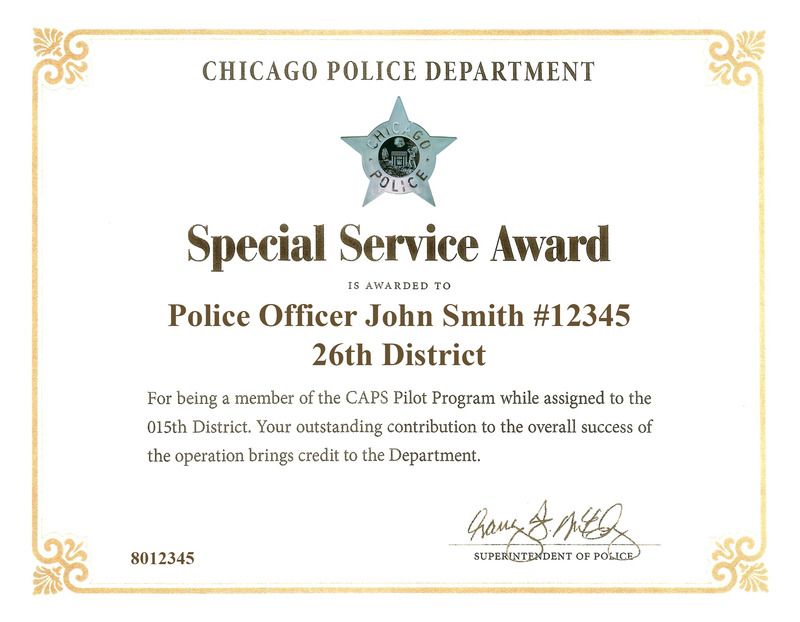 Civilian Department Members and Community Members in the form of a Chicago Alternative Policing Strategy (CAPS) lapel pin and certificate. Color: Composed of blue, light blue and red colors. Centered shall be a 1/4 inch red vertical stripe with a vertical light blue stripe positioned approximately 1/8 inch from each end. Centered within the light blue stripe will be one dark blue vertical stripe approximately 1/16 inch wide. This ribbon is similar in size and design to the U.S. Air Force Combat Readiness Ribbon. Description: An award granted to any Sworn Department Member who receives an outside governmental agency award that is awarded by a municipal, county, state or federal agency, excluding awards issued while in the military, as a result of exceptional performance of duty and has brought credit to the Department and: 1. is not issued a ribbon bar by the awarding agency, or 2. the issued ribbon bar conflicts in size or design with current Department ribbon bars. This award was originally named the “Recognition Ribbon Award” and was renamed effective March 1, 2011. Presentation: This award is presented to Sworn Department Members in the form of a ribbon bar. Color: Composed of dark blue, red and white colors. Centered shall be a 1/8 inch wide vertical dark blue stripe. On each side of the dark blue stripe will be a 1/16 inch wide vertical white stripe. On each side of the white stripe will be a 3/8 inch wide vertical red stripe. On each side of the red stripe will be a 1/16 inch wide vertical white stripe. On each end will be a 1/8 inch wide vertical dark blue stripe. This ribbon is similar in size and design to the U.S. Air Force Organizational Excellence Ribbon. Description: An award presented to any Sworn or Civilian Department Member or Citizen who has made a significant impact on public safety or crime prevention. Presentation: This award is presented to Sworn Department Members in the form of a ribbon bar and certificate. 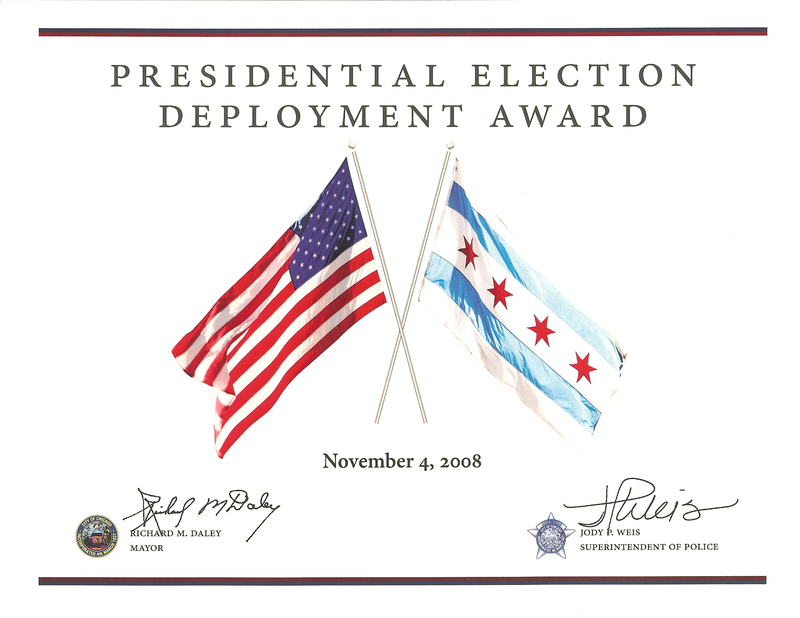 Civilian Department Members and Citizens are presented with this award in the form of a Chicago Alternative Policing Strategy (CAPS) lapel pin and certificate. Color: Composed of gold and royal blue colors. Centered shall be a 3/16 inch wide vertical royal blue stripe. On each side of the royal blue stripe shall be a 1/16 inch wide vertical light gold stripe followed by a 1/32 inch wide vertical royal blue stripe. On each end shall be a 5/16 inch wide vertical light gold stripe followed by a 1/16 inch wide vertical royal blue stripe. This ribbon is similar in size and design to the U.S. Air Force Commendation Medal Ribbon. Description: An award presented to any Sworn or Civilian Department Member whose service contributed to an event that has a significant impact upon the historical directions and operations of the Department. Presentation: This award is presented to Sworn Department Members in the form of a ribbon bar and certificate. 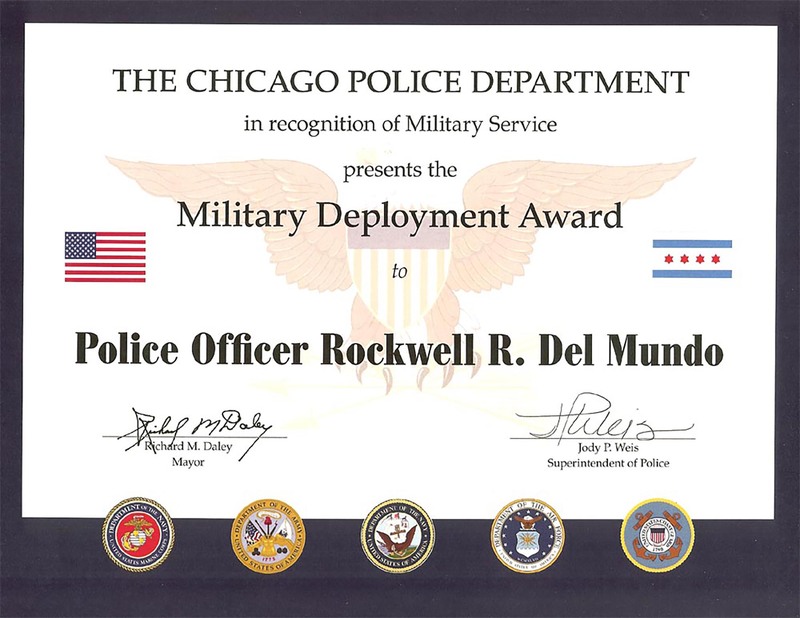 Civilian Department Members are presented with this award in the form of a Chicago Alternative Policing Strategy (CAPS) lapel pin and certificate. Color: Composed of light blue and white colors. Centered shall be a vertical light blue stripe measuring 5/8 inch wide. On each side of the light blue stripe shall be a 1/16 inch wide vertical white stripe. On each end shall be a 1/4 inch wide vertical light blue stripe. This ribbon is similar in size and design to the United Nations Medal Ribbon. Description: An award that was presented by the Chicago Transit Authority (CTA) for help with a CTA elevated train derailment in the late 1970’s. This award was also presented by the CTA to all members of Unit 701 – Public Transportation Section in 1991. 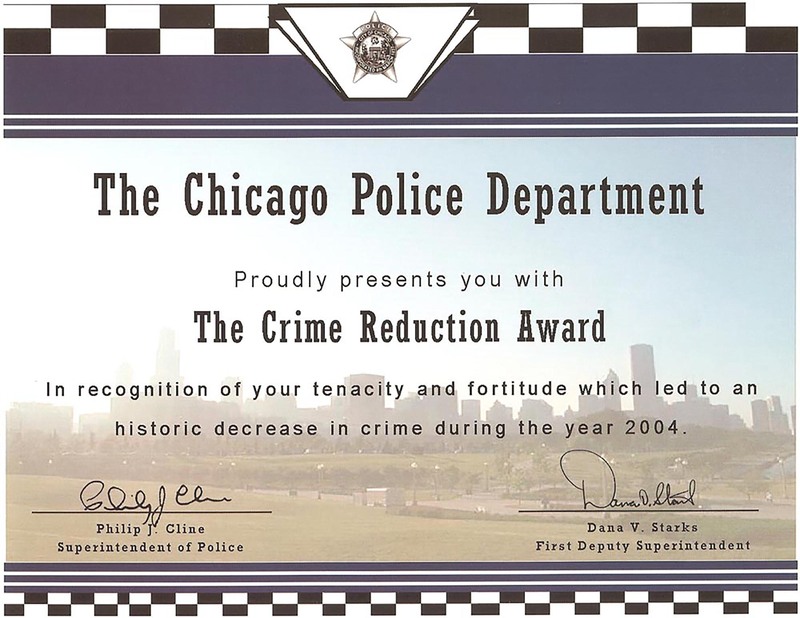 The award was presented in recognition of the dramatic decrease in crime on the CTA Rapid Transit System, in 1990, due to the coordinated efforts of watch, tactical and canine personnel assigned to the unit. Presentation: This award was presented to Sworn Department Members in the form of a ribbon bar and certificate. Color: Composed of dark blue, red and white colors. Centered shall be a vertical white stripe measuring approximately 7/16 inch wide. There shall be a vertical red stripe measuring approximately 7/16 inch wide on the left side and a vertical blue stripe measuring approximately 7/16 inch wide on the right side. This ribbon is similar in size and design to the Alaska National Guard Distinguished Service Medal Ribbon. Description: An award granted to any Sworn Department Member who in the performance of their duty warrants recognition, from the department, for exceptional commitment to the recovery of illegal firearms. The awarded member will have the highest number of incidents during one police period which led to arrestees being charged with firearms-related offenses. Color: Composed of light blue, green and yellow. Centered shall be a green stripe approximately 3/4 inch wide. There will be two 1/16 inch wide yellow stripes on each side of the center stripe. A 1/4 inch light blue stripe will border each edge. This ribbon is similar in size and design to the U.S. Air Force Small Arms Expert Marksmanship Ribbon. 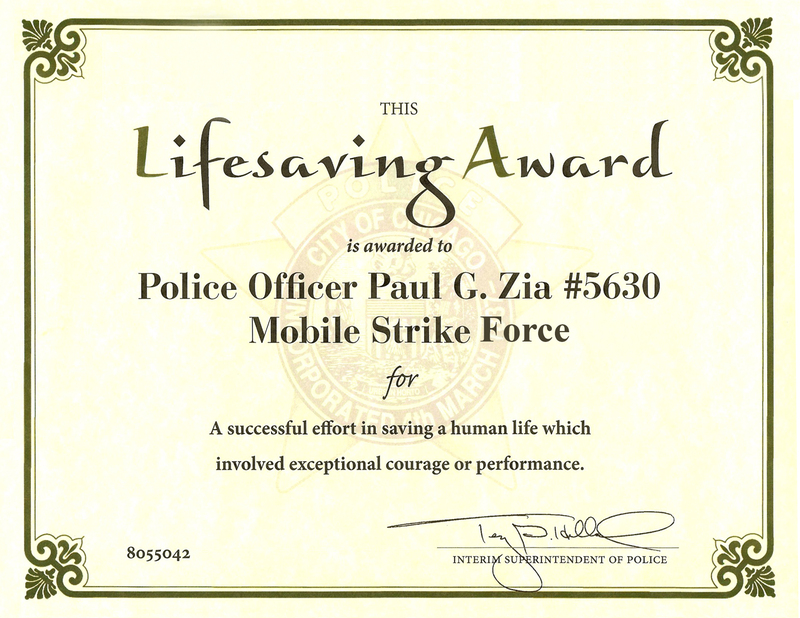 Description: An award granted to any Sworn Department Member who in the performance of their duty warrants recognition, from the department, for excellence in conducting professional traffic stops that result in quality arrests. Color: Composed of dark blue, red, yellow and white. Centered will be a red stripe measuring approximately 3/8 inch wide. There will be two 1/16 inch wide vertical white stripes on both sides of the center stripe. There will be two 1/8 inch wide vertical dark blue stripes on both sides of the white stripes. A 1/4 inch yellow stripe will border each edge. This ribbon is similar in size and design to the U.S. Army Reserve Components Achievement Medal Ribbon. Description: An award granted to individual Sworn or Civilian Department Members of a unit who exhibited exceptional professional skill and conduct during a coordinated action. Although this award was established on March 30, 1972 it was only presented in the form of a certificate. The corresponding ribbon bar wasn’t established until October 20, 1988. Color: Composed of a scarlet red color. This ribbon shall be a 1 1/4 inch vertical scarlet red stripe. This ribbon is similar in size and design to the Connecticut National Guard Long Service Medal Ribbon.